Op-ed that was published in the Business Times, 5 August 2015 just after David Cameron’s SEA visit. 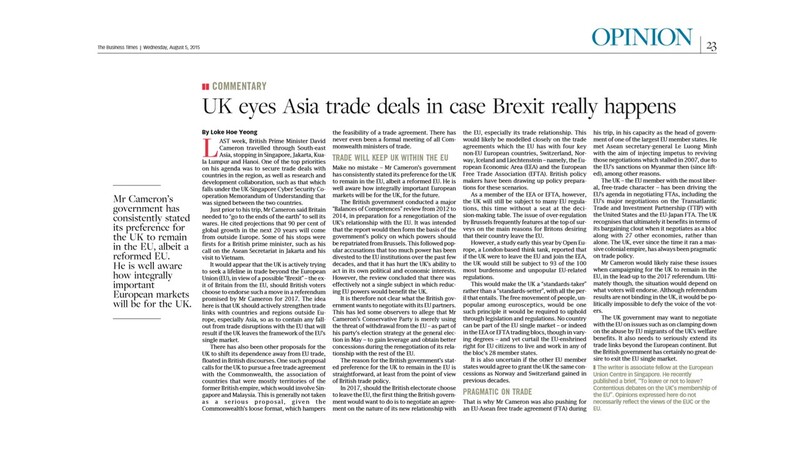 5 August 2015, Singapore –Hornbills assisted one of our associates, Mr Loke Hoe Yeong (a free –trade analyst and keen observer of EU – UK affairs), to place an opinion piece into the Business Times today. We worked with him to identify a topic that was timed for release around David Cameron’s visit to Southeast Asia last week. This op-ed was part of his longer policy brief called, “To leave or not to leave? Contentious debates on the United Kingdom’s membership of the European Union”. The full text of this policy brief, published by the EU Centre, can be found here. To read the full text of the above article from the Business Times, please click here.